75 years ago (1944): Bobby Jones and Clifford Roberts decided after the 1942 Masters to stop the tournament for the rest of World War II. According to the Augusta Chronicle, the club’s greenskeeper raised turkey and cattle on the grounds while the club was closed. Roberts said in his autobiography that the cattle destroyed several azalea and camellia bushes and ate the bark of several young trees. There were plenty of connections to the Masters. Jones was commissioned as a captain in the Army Air Corps, and his unit landed at Normandy a day after the D-Day invasion. Leading the Normandy invasion was Gen. Dwight D. Eisenhower, who later became a member at Augusta National during his two terms as U.S. president. 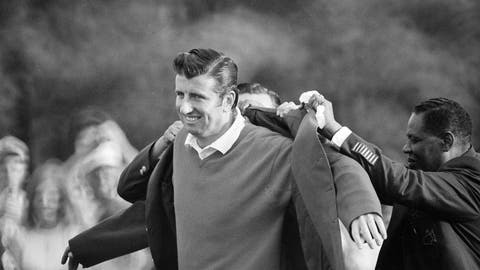 50 years ago (1969): George Archer closed with an even-par 72 and won his only major championship in the 1969 Masters. Billy Casper had at least a share of the lead after every round, but he was 5 over through 10 holes and his rally came up short. Tom Weiskopf was tied for the lead late in the final round until a bogey on the 17th hole. That was the first of his record four runner-up finishes at Augusta National. Archer finished at 7-under 281. It was his only top 10 in the Masters. The 1969 Masters also was the first time since 1956 that neither Jack Nicklaus, Arnold Palmer or Gary Player finished in the top 10. 25 years ago (1994): Jose Maria Olazabal followed Seve Ballesteros, his Spanish idol, by winning his first Masters. And the game must have looked familiar. Olazabal was trailing Tom Lehman going into the final round and closed with a 69 for a two-shot victory. For the week, Olazabal had one-putted 30 times, chipped in twice and saved par all six times he was in a bunker. Lehman was one shot behind when his 1-iron off the tee at No. 18 went into a bunker and he made bogey. It was the first of five times over the next fours that Lehman had at least a share of the 54-hole lead in a major. He won the 1996 British Open. 20 years ago (1999): Jose Maria Olazabal joined Seve Ballesteros with two green jackets by closing with a 71 for a two-shot victory over Davis Love III. But the real challenge came from Greg Norman, who was on the verge of redeeming himself from three past failures at the Masters by making a 30-foot eagle putt on No. 13 to take the lead in the final round. Olazabal made a 20-foot birdie to tie, and he played bogey-free down the stretch while Norman dropped shots on the 14th and 15th to fall behind. Olazabal only a few years earlier had such a severe back injury that he feared he might never walk again. He was the only player to win two Masters in the 1990s. 10 years ago (2009): Angel Cabrera won on the second playoff hole to become the first Argentine in a green jacket. He closed with a 71 to join Kenny Perry and Chad Campbell in the first three-man playoff in 22 years. Campbell was eliminated on the first playoff hole with a bogey from the bunker on No. 18, where Cabrera saved par from the fairway after hitting a tree. Perry made bogey from left of the green on No. 10, allowing Cabrera to win with a par. The 48-year-old Perry had a chance to become the oldest major champion when he had a two-shot lead with two holes to play. He made bogey on both holes, falling into a playoff. For the longest time, the show belonged to Tiger Woods and Phil Mickelson. Paired in the final round for the first time since 2001, they delivered a high-charged duel. Mickelson shot 67 to finish one ahead of Woods, who had a 68. 5 years ago (2014): Bubba Watson won his second green jacket with a 3-under 69 that denied 20-year-old Jordan Spieth from becoming the youngest Masters champion. Watson and Spieth were tied going into the final round, and Spieth had a two-shot lead with 11 holes to play until a pair of two-shot swings. Spieth made bogey on the 8th and 9th, Watson made birdie. Watson took a two-shot lead to the back nine, and Spieth made too many mistakes to challenge him. Spieth wound up tied for second with Jonas Blixt, another Masters rookie. Spieth would go on to win the following year by tying the tournament record at 270.